A pair of mating Habropoda depressa. Bees are fascinating and important creatures. However, they do have one characteristic that's not so appealing to us humans: They sting! The best strategy to avoid bee stings while continuing to enjoy the many benefits of having bees in your yard is simply to know a little bit about where bees are and what they are doing. If you get out early enough, it is sometimes possible to see striped male anthophorids with long reddish-brown antennae sleeping in flowers of Cosmos bipinnatus. Later on in the day, the most popular bee flowers will be covered with territorial male bees zipping back and forth, charging and tackling other bees and shoving them off flowers in a constant battle for dominance. It is hard to imagine the nerve of some of the smaller bees, which attack bees three times their size - especially since their threatening gestures are all a facade. Despite their occasional aggressive behavior, male bees of all species are stingless. One way to distinguish females from males is that, on a good day, females' legs, head, or bellies - depending on the species - are covered with bright blobs of yellow, purple, or white pollen. Females spend most of their time shimmying through pollen and sipping nectar from their favorite flowers, while males are frequently attending other business. 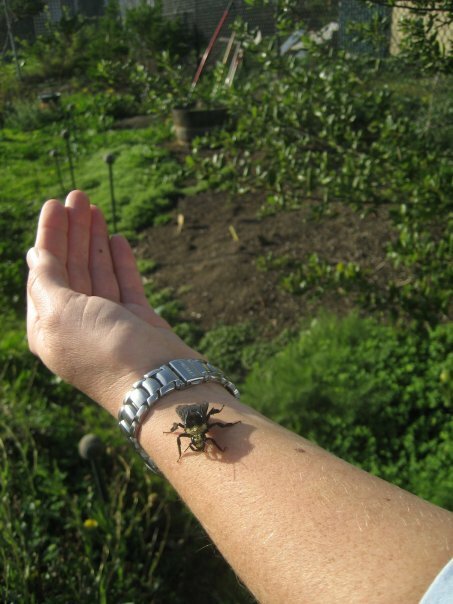 A Yellow-Faced Bumble bee crawling up a researcher's arm. Contrary to conventional wisdom, bees are not aggressive. 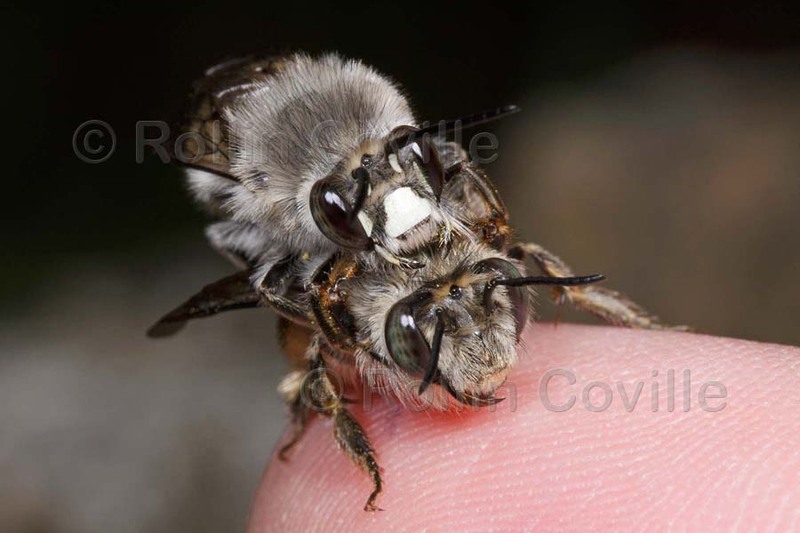 To a bee biologist, behavior that appears aggressive would be more aptly characterized as defensive. Most bees are simply too busy to take notice of human observers. There is one exception - Africanized honey bees (which have not yet reached northern California) and some species of bumble bees which will defend their nests against perceived intruders. During the course of our research, we have had the opportunity to watch thousands of bees in action, taking notes on their behavior within several inches of their stingers. We have never had to wear protective gear and have never been stung on the job! Moreover, as we continue to collect data on urban bees, we expect to provide gardeners with useful information on which flowers to plant in order to attract - or avoid - honeybees and native bees. With just a little awareness about what bees are up to - for example, pollinating the white clover, Trifolium repens in your lawn - it is easy to enjoy these wonderful little creatures without ever being stung!